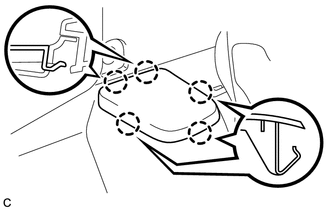 (a) Disengage the 5 claws, and then remove the deck side trim. 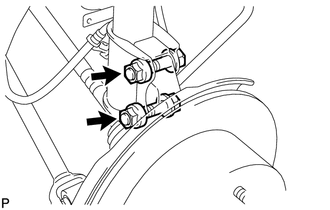 (a) Remove the bolt and separate the rear flexible hose from the rear shock absorber with coil spring. 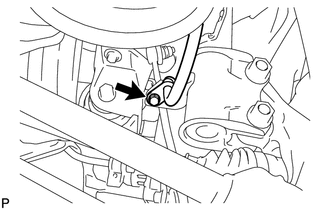 (a) Remove the bolt and separate the rear speed sensor wire from the rear shock absorber with coil spring. 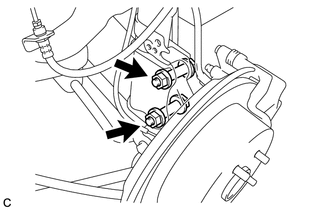 (a) Remove the bolt and separate the rear speed sensor from the rear shock absorber with coil spring. 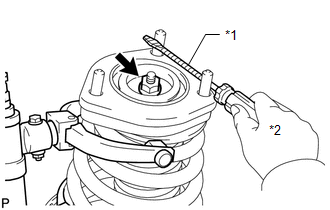 (a) Remove the nut and separate the rear stabilizer link assembly from the rear shock absorber with coil spring. 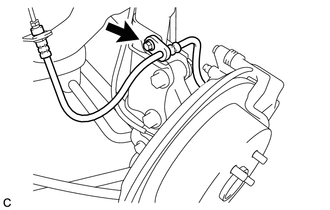 (a) Disengage the 4 claws and remove the rear No. 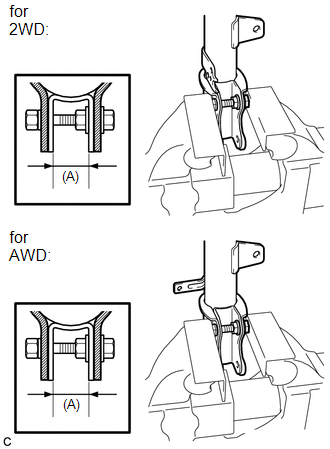 1 suspension support cover. 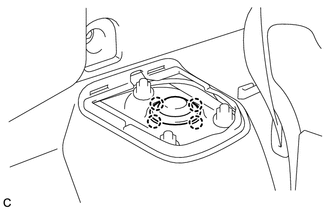 Do not deform the brake dust cover. 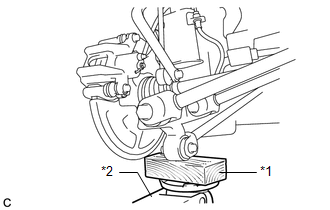 Support the rear axle carrier sub-assembly until reinstallation of the rear shock absorber with coil spring is complete. 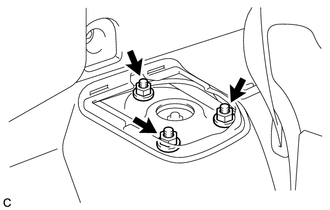 (b) Loosen the rear support to rear shock absorber nut. 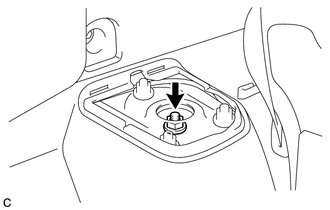 Do not remove the rear support to rear shock absorber nut. 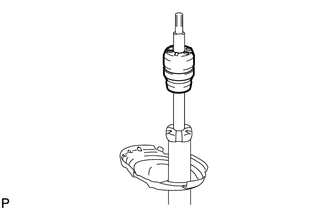 Loosen the nut only when the rear shock absorber with coil spring needs to be disassembled. 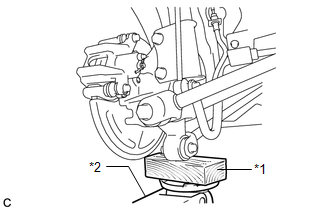 (c) Remove the 2 bolts and 2 nuts, and separate the rear shock absorber with coil spring from the rear axle carrier sub-assembly. (d) Remove the 3 nuts and rear shock absorber with coil spring. 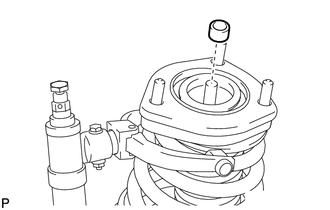 Make sure that the rear speed sensor and rear flexible hose are disconnected from the rear shock absorber with coil spring. 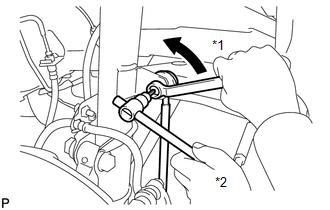 (a) Install the bolt and nut to the rear shock absorber with coil spring as shown in the illustration and secure the rear shock absorber with coil spring in a vise. 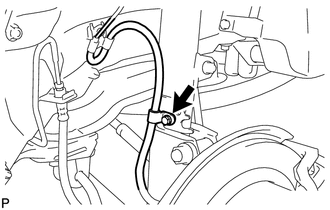 (b) Check that the rear coil spring is fully compressed. 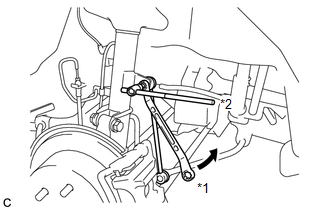 (c) Using a screwdriver or an equivalent tool to hold the rear suspension support assembly, remove the rear support to rear shock absorber nut from the rear shock absorber assembly. 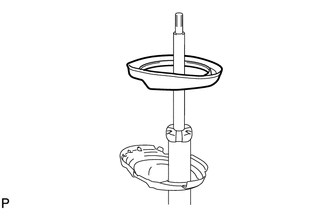 (a) Remove the rear support to rear shock absorber collar from the rear shock absorber assembly. 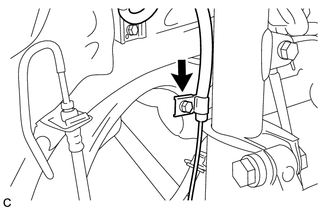 (a) Remove the rear suspension support assembly from the rear shock absorber assembly. 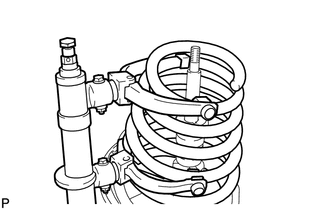 (a) Remove the rear coil spring together with SST from the rear shock absorber assembly. (a) Remove the rear No. 1 spring bumper from the rear shock absorber assembly. 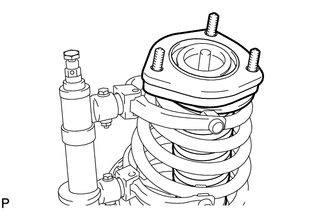 (a) Remove the rear lower coil spring insulator from the rear shock absorber assembly.